The number of migrant apprehensions at the U.S.-Mexico border rose by 42% in October and November of 2016 compared with the same two-month period in 2015, according to a Pew Research Center analysis of U.S. Customs and Border Protection data. The 93,405 apprehensions were the most in any October-November period in at least five years. The increase was fueled in part by a jump in the number of apprehensions of people traveling in family units. There were 28,691 apprehensions of individuals traveling with family members — defined as children, parents or a legal guardian — in October and November, a 130% increase from the same period in 2015. In November alone, the number of apprehensions of family units reached 15,573, the largest monthly total since June 2014, when a record 16,330 apprehensions were made during a surge in migration from Central America. In the 2016 fiscal year (Oct. 1, 2015 to Sept. 30, 2016), there were 408,870 total apprehensions at the Southwest border, up from 331,333 apprehensions in fiscal 2015. Historically, the number of apprehensions has spiked in the spring and early summer months, before dipping in the late summer, fall and winter months. But in fiscal 2016, apprehensions rose in August and September, with monthly totals that approached the highs of April and May. Also in fiscal 2016, apprehensions of Central Americans exceeded that of Mexicans for just the second time. This first occurred in 2014, when there was a record surge in apprehensions of unaccompanied children and families, mostly from El Salvador, Honduras and Guatemala. 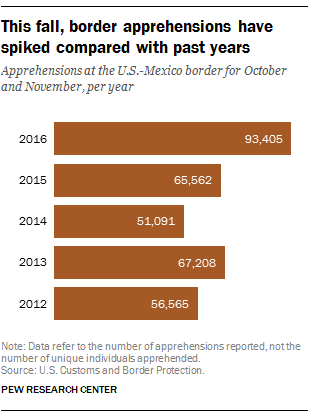 Apprehensions dropped in 2015 due in part to increased immigration enforcement by the Mexican government at its southern border and internally, which made it more difficult for Central Americans to travel through Mexico to reach the U.S.